« Lunapads Contest Giveaway Ends in One Week! I took my younger brother and sister to see Night at the Museum: Battle of the Smithsonian this weekend. As a lover of the Museum of Natural History, I laughed along with the first movie, Night at the Museum, enough to be able to ignore its cheesier moments. Also a lover of the Smithsonian Museums, I was confident this would be true for the second as well – and it was, except for one glaring flaw. As I was notified by my Google News Alerts, many reviews of Night at the Museum 2 promised a specimen of a giant squid come to life. This, of course, was a big draw for me – the only thing I enjoy more than giant squid specimens are, in fact, live giant squid (well, I think – I’ve never met one in person). Yeah, well, that’s a great thought and all, but whoever did the animation for this movie royally f’ed up: their so called “giant squid” was actually a giant-squid-colored extra-large octopus! 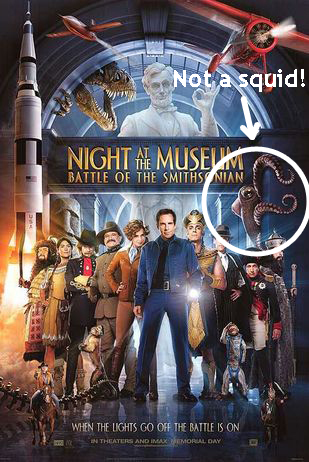 When I kvetched about this to my mother after seeing the movie, she pointed out that I’m probably one of very few people who noticed the error at all, because a lot of people don’t recognize the differences between squid and octopi. In fact, she said the only reason she could tell them apart is because of me, and the fact that I’ve talked about it ad nauseam because of my obsession with giant squid. 1) Size – Both cephalopods come in all different sizes and colors, but concerning this movie, as far as I know there are no octopi that come close in size to the giant squid. 2) Mantles – both have them, but they are distinctly different in shape. Octopi have a round, bulbous mantle. Squid have a slimmer, bullet-shaped mantle with fins attached at the top (kind of looks like a spade). 3) Arms/Tentacles & Suckers – Octopi have eight arms covered in suckers. Squid also have eight sucker-lined arms, as well as two tentacles, that only have suckers at their larger spade-shaped ends, for a total of 10 appendages. 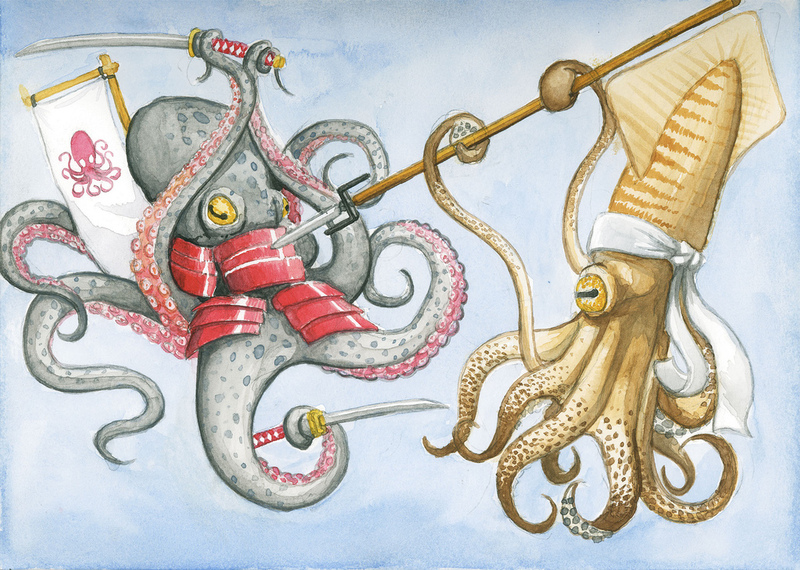 While the suckers lining the arms of both of these cephalopods are generally harmless, they can be weapons in certain species. Giant squid have suckers lined with a hard serrated edge. Colossal Squid have large swiveling hooks inside each sucker. 4) Where they hang out (in case you happen to run into one) – Octopi are sea floor dwellers, and live in dens and caves along the bottom of the ocean. Squid live in open water and tend to explore the deep sea. If you didn’t figure it out yourself, the octopus is on the left and the squid is on the right! Octopi? You mean octopodes (or even octopuses)? Yes! All three are accepted plural forms of octopus. There are three used plural forms. There is one correct one, one acceptable one, and one incorrect one. There are many words an phrases used incorrectly in English. Just because they are in common use, does not make them correct. Thank you for enlightening me. While octopi may be, as you say, “incorrect”, because the word octopus is not actually of Latin origin and should not be pluralized as such, because of this mistake it has been time and time again and therefore it is an accepted word and can be found in any dictionary as a plural form of octopus. I’m sorry if you take issue with my usage of it because you don’t like that form, but honestly, I don’t feel I’m wrong and it’s staying as is.